& when you book quote ‘GVA3’ to claim your gift voucher. Call us or fill in the form on the right to discuss your booking with our professional and friendly team. When you book your venue we’ll send you a gift voucher to say thank you. Don’t forget to quote ‘GVA3’ when booking. Numerous gift vouchers available from John Lewis, Thomas Cook & Argos. 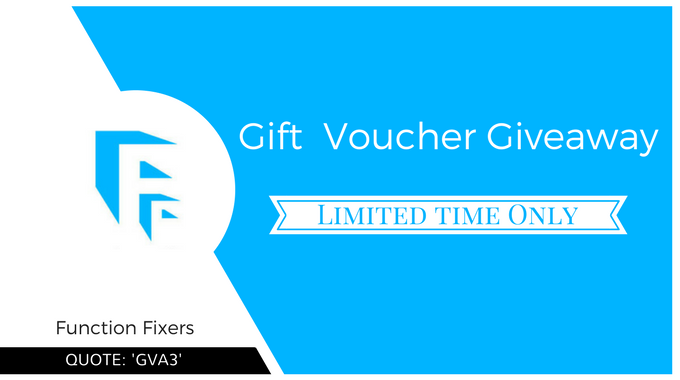 Simply book your venue through Function Fixers and we’ll reward you with a gift voucher. Remember to Quote ‘GVA3’ when booking. T&Cs apply. This giveaway is valid for bookings in March, April & May 2017 (subject to voucher availability). 1. The gift voucher giveaway is open to residents of the United Kingdom aged 18 years or over except employees of Function Fixers and their close relatives and anyone otherwise connected with the organisation. 2. A booking of over £1,200 in value is necessary to claim your voucher. 3. Only one claim will be accepted per company. 4. Closing date for claiming will be 31st May 2017. After this date no further vouchers can be claimed. 5. No responsibility can be accepted for bookings where the promo code has not been quoted. 6. The promo code must be quoted during the booking stage, quoting the promo code after booking completion will result in no voucher being sent out. 7. We reserve the right to cancel or amend the giveaway and these terms and conditions without notice. 8. No cash or other alternatives will be offered. The vouchers are not transferable. 9. Vouchers are subject to availability and we reserve the right to substitute any prize with another of equivalent value without giving notice.